◦ The ship has weather'd every crack, the prize we sought is won. ◦ But O heart! heart! heart! ◦ Fallen cold and dead. 5. What does T.S. 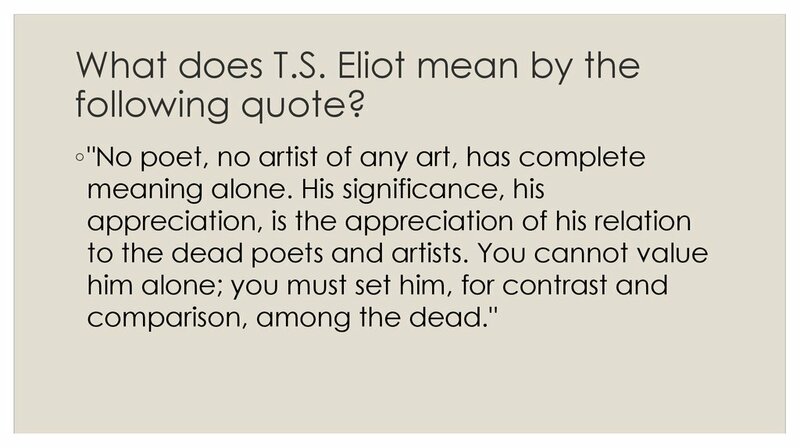 Eliot mean by the following quote? 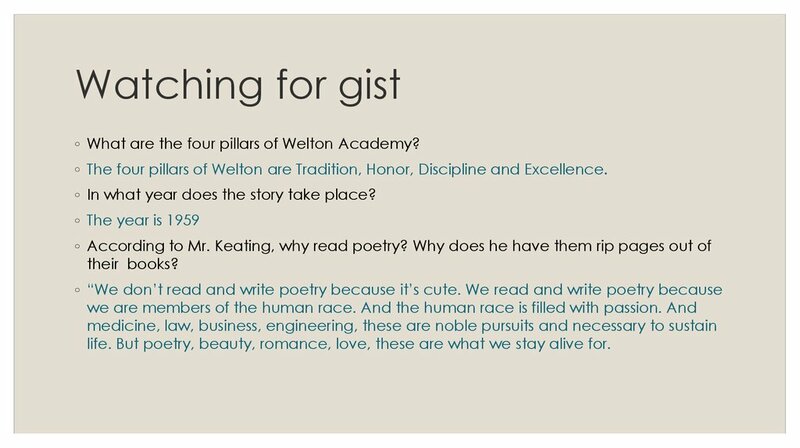 ◦ What are the four pillars of Welton Academy? ◦ The four pillars of Welton are Tradition, Honor, Discipline and Excellence. 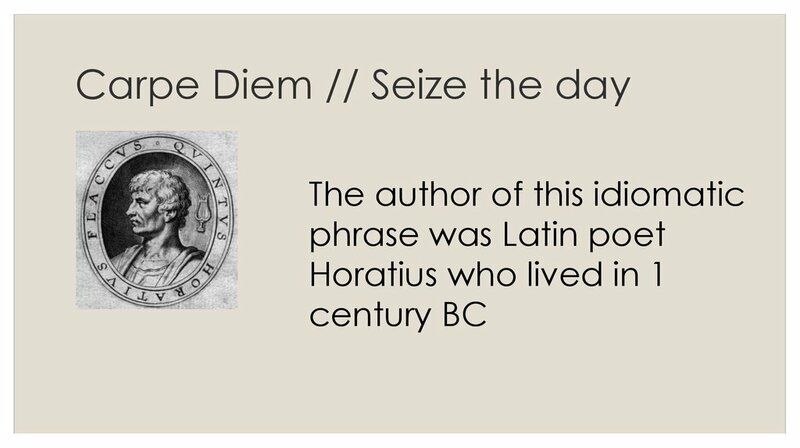 ◦ In what year does the story take place? life. But poetry, beauty, romance, love, these are what we stay alive for. 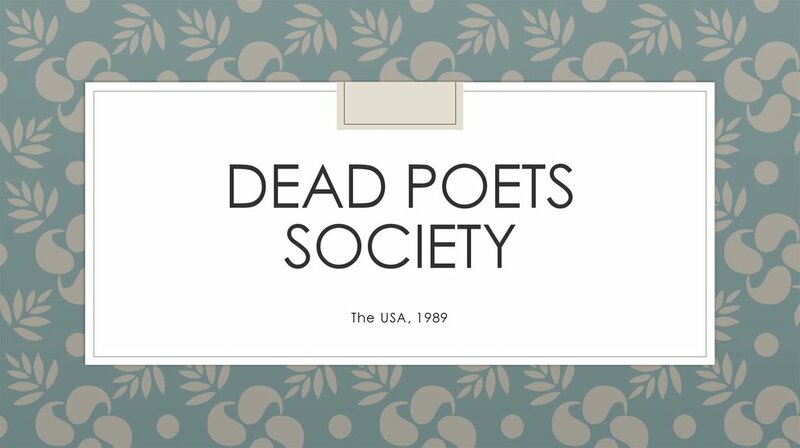 ◦ Why would the "present administration" not look favorably on the Dead Poets Society? 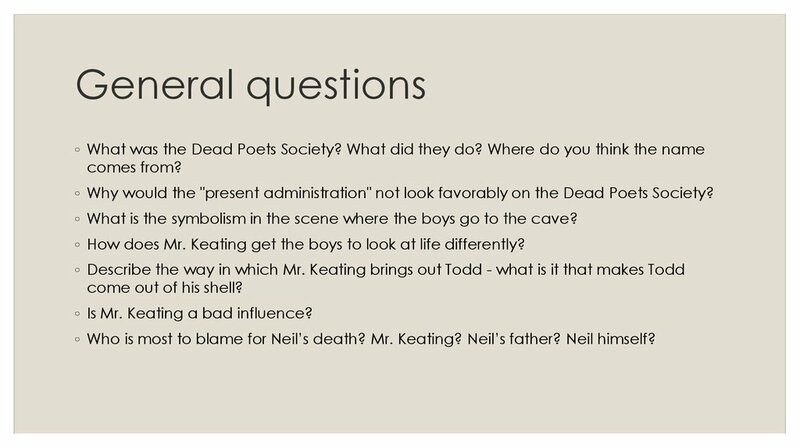 ◦ What is the symbolism in the scene where the boys go to the cave? 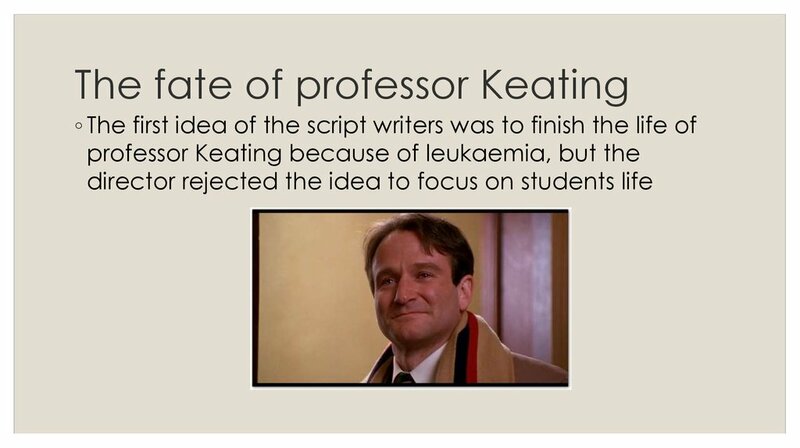 ◦ How does Mr. Keating get the boys to look at life differently? come out of his shell? ◦ Is Mr. Keating a bad influence? 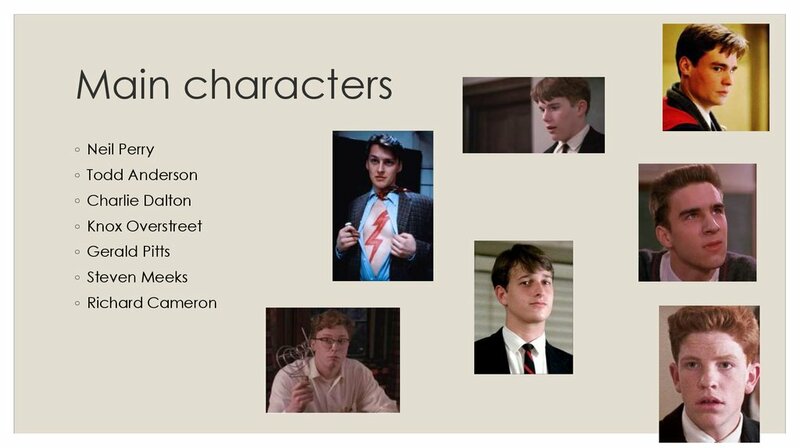 ◦ Who is most to blame for Neil’s death? Mr. Keating? Neil’s father? Neil himself? more effective means of instruction and learning? Why? ◦ 2. Talk about an experience in school or a teacher who changed your life. ◦ 3. What adjectives could you use to describe the teachers at Welton? the students? ◦ 4. 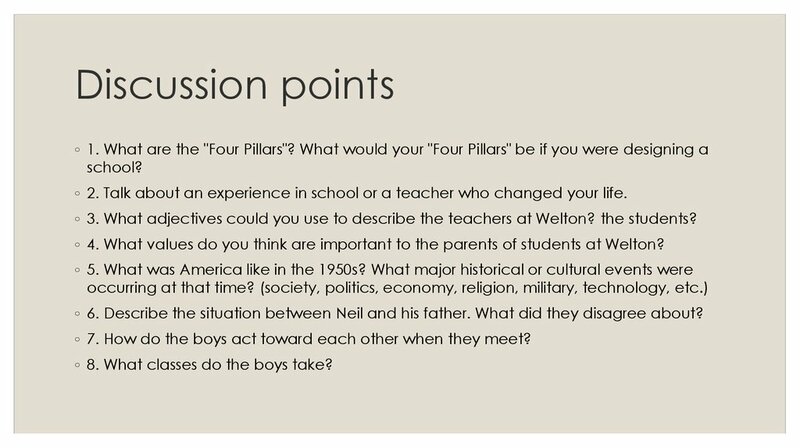 What values do you think are important to the parents of students at Welton? ◦ 6. Describe the situation between Neil and his father. What did they disagree about? ◦ 7. How do the boys act toward each other when they meet? ◦ 8. What classes do the boys take? ◦ 1. 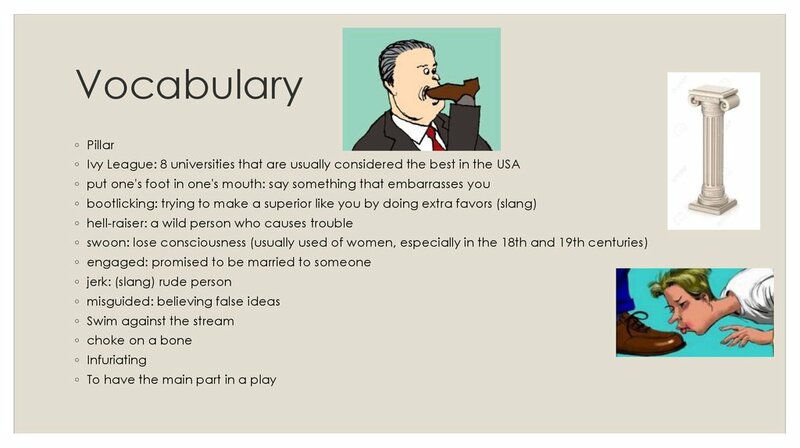 What is unusual about Mr. Keating's English class? ◦ 2. What does Keating ask the students to call him? Why does he ask them to call him this? ◦ 3. How does Keating try to gain the boys' trust? 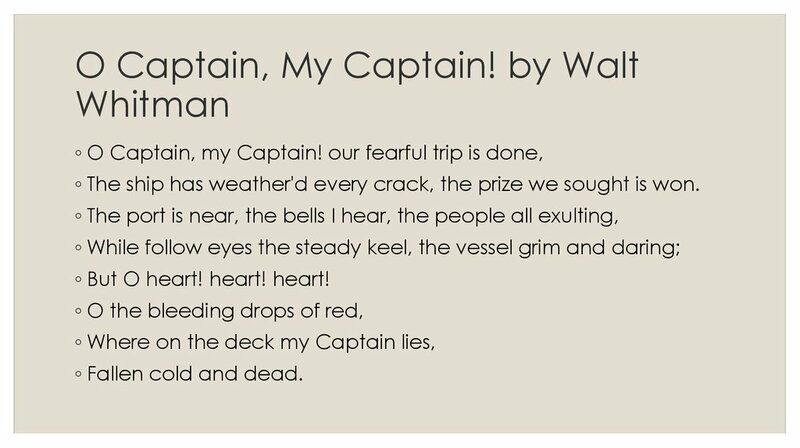 talks about a "ship" and a "fearful trip". What is he referring to through these images? ◦ 6. 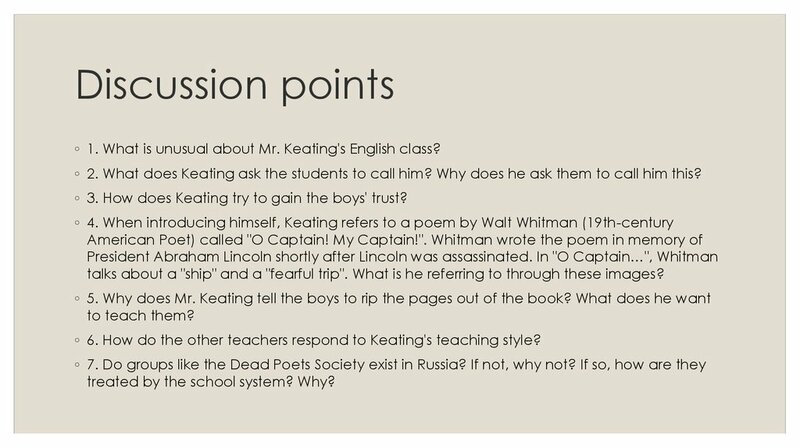 How do the other teachers respond to Keating's teaching style? treated by the school system? Why?